The Elementary and Secondary Education Act (ESEA) was passed as a part of United States President Lyndon B. Johnson's "War on Poverty" and has been the most far-reaching federal legislation affecting education ever passed by the United States Congress. The act was an extensive statute that funded primary and secondary education. It also emphasizes equal access to education and establishes high standards and accountability. In addition, the bill aimed to shorten the achievement gaps between students by providing each child with fair-equal opportunities to achieve an exceptional education. As mandated in the act, the funds are authorized for professional development, instructional materials, for resources to support educational programs, and for parental involvement promotion. On January 25, 1965, President Lyndon B. Johnson called for congressional efforts to improve education opportunities for America's children. Wary of popular fears regarding increased federal involvement in local schools, the Johnson administration advocated giving local districts great leeway to use the new funds, which were to be first distributed as grants to each state. Shortly thereafter, Carl D. Perkins (D-KY), the chair of the General Education Subcommittee of the House Committee on Education and Labor introduced H.R. 2362. 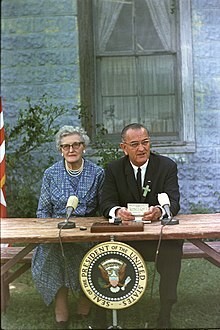 With the Johnson administration's support, and after significant wrangling over the structure of the bill's funding formula committee, the full committee voted 23–8 to report it on March 2, 1965. Following a failed attempt to derail the bill by Representative Howard W. Smith (D-VA), the House passed H.R. 2362 on March 26, 1965 in a 263–153 roll-call vote. As the Senate prepared to consider the education bill, S. 370, Democratic leaders urged their colleagues to pass it without amendment, in hopes of avoiding the bill to be returned to the House to endure further reconsideration. S. 370 was assigned to the Senate Labor and Public Welfare Committee, which subsequently reported the bill to the Senate floor with unanimous support. During the Senate debates, several amendments were introduced, though none passed. The Senate passed the bill in a 73–18 vote on April 7, 1965. President Johnson signed the Elementary and Secondary Education Act into law two days later on April 9, 1965. "Title I" redirects here. For other uses of "Title I", see Title I (disambiguation). Title I ("Title One"), which is a provision of the Elementary and Secondary Education Act passed in 1965, is a program created by the U.S. Department of Education to distribute funding to schools and school districts with a high percentage of students from low-income families, with the intension to create programs that will better children who have special needs that without funding could not be properly supported . Funding is distributed first to state educational agencies (SEAs) which then allocate funds to local educational agencies (LEA's) which in turn dispense funds to public schools in need. Title I also helps children from families that have migrated to the United States and youth from intervention programs who are neglected or at risk of abuse. The act allocates money for educational purposes for the next five fiscal years until it is reauthorized. In addition, Title I appropriates money to the education system for the persecution of high retention rates of students and the improvement of schools; these appropriations are carried out for five fiscal years until reauthorization. According to the National Center for Education Statistics, to be an eligible Title I school, at least 40% of a school's students must be from low-income families who qualify under the United States Census's definition of low-income, according to the U.S. Department of Education. Title I mandates services both to eligible public school students and eligible private school students. This is outlined in section 1120 of Title I, Part A of the ESEA as amended by the No Child Left Behind Act (NCLB). Title I states that it gives priority to schools that are in obvious need of funds, low-achieving schools, and schools that demonstrate a commitment to improving their education standards and test scores. There are two types of assistance that can be provided by Title I funds. The first is a “schoolwide program” in which schools can dispense resources in a flexible manner. The second is a “targeted assistance program” which allows schools to identify students who are failing or at risk of failing. Assistance for school improvement includes government grants, allocations, and reallocations based on the school's willingness to commit to improving their standing in the educational system. Each educational institution requesting these grants must submit an application that describes how these funds will be used in restructuring their school for academic improvement. Schools receiving Title I funding are regulated by federal legislation. Most recently, this legislation includes the No Child Left Behind Act, which was passed in 2001. In the 2006–2007 school year, Title I provided assistance to over 17 million students who range from kindergarten through twelfth grade. The majority of the funds (60%) were given to students between kindergarten through fifth grade. The next highest group that received funding were students in sixth through eighth grade (21%). Finally, 16% of the funds went to students in high school with 3% provided to students in preschool. In its original conception, Title I under the ESEA, was designed by President Lyndon B. Johnson to close the skill gap in reading, writing and mathematics between children from low-income households who attend urban or rural school systems and children from the middle-class who attend suburban school systems. This federal law came about during President Johnson's “War on Poverty” agenda. Numerous studies have been conducted since the original authorization of the ESEA in 1965 that have shown that there is an inverse relationship between student achievement and school poverty. Specifically, student achievement has been found to decrease as school poverty increases. According to the United States Department of Education (USDOE), students from low-income households are “three times as likely to be low achievers if they attend high-poverty schools as compared to low-poverty schools.” Within this context, Title I was conceived in order to compensate for the considerable educational deprivations associated with child poverty. In the years following 1965, Title I has changed considerably. For the first 15 years, the program was reauthorized every three years with additional emphasis placed on how funds were to be allocated. In the course of these reauthorizations, strict federal rules and regulations have been created for the guarantee that funds would be allocated solely to students in need – specifically students eligible for services based on socioeconomic status and academic achievement. Regulations also included added attention to uniformity in regards to how resources were distributed to Title I and non-Title I schools as well as the role of parents in the revisions of the program. In addition to more stringent rules, during these years, policy makers outlined punitive actions that could be taken for those who were out of compliance. Attention was also placed upon the assurance that Title I funds would not serve as replacements for local funds; but rather they would serve as subsidiary resources. These federal regulations, which were focused on financial resources, influenced local Title I programs in many ways. Pull-out programs were adopted by Title I schools in order to comply with the financial stipulations that were made in the initial reauthorizations. These programs separated eligible students from ineligible ones to ensure that those who were in-need would benefit from the program. By 1978, in response to the extensive criticism of pull-outs on the grounds that they were asynchronous with the instruction occurring in Template:Classrooms, another option for providing assistance to students was introduced, the school wide approach. Schools with a student body in which the make-up had 100% or more low-income students could use Title I funds for the entire school's improvement rather than for specific individuals. Despite this amendment, local fund requirements prevented all eligible students from using the school wide approach. During the Reagan Administration, Congress passed the Education Consolidation and Improvement Act (ECIA) in 1981 to reduce federal regulations of Title I. This reflected the administration's stance that resource control should be in the hands of states and local jurisdictions rather than at a federal level. Despite the change outlined by the ECIA and the new designation of Title I as Chapter I, little was done to implement it and traditional Title I practices, like the use of pull-outs, continued. As the financial regulations became incorporated into practice, the conversation shifted around Title I to student achievement. In 1988, the Hawkins-Stafford Elementary and Secondary School Improvement Act, re-focused Title I on cultivating school improvement and excellent programs. The additions that were made through this legislation called for synchrony between Chapter I and classroom instruction, it raised the achievement standard for low-income students by emphasizing advanced skills instead of basic ones and increased parental involvement. It also had two new provisions: program improvement and school wide projects. Program improvements were modifications that would occur when students who received funding were not improving. The school wide projects altered the requirement that local funds had to match school wide program funding by Title I, allowing a larger number of high need schools to implement school wide programming. A 1993 National Assessment noted shortcomings of the 1980s alterations to Title I. These catalyzed the introduction of the 1994 Improving America's Schools Act (IASA), which significantly revised the original ESEA. This was the last major alteration prior to those made by No Child Left Behind. The IASA attempted to coordinate federal resources and policies with the pre-existing efforts at the state and local levels in order to improve instruction for all students. This reform made three major changes to Title I. It added math and reading/language arts standards to be used to assess student progress and provide accountability. It reduced the threshold for schools to implement school-wide programs from 75% poverty to 50% and gave schools a longer reign to use federal funding from multiple programs to dispense funds at a school wide level. Lastly, the IASA gave more local control overall so that federal officials and states could waive federal requirements that interfered with school improvements. The most recent and significant alteration to the original Title I was made by its reauthorization under No Child Left Behind (NCLB). In this reauthorization, NCLB required increased accountability from its schools both from the teachers and from the students. Yearly standardized tests were mandated in order to measure how schools were performing against the achievement bars set by Title I. Schools were also responsible for publishing annual report cards that detailed their student achievement data and demographics. Schools were now held accountable not only by punitive measures that would be taken if schools fail to meet Adequate Yearly Progress (AYP), but also corrective actions were taken if states did not have an assessment system approved by Title I. Under NCLB, Schools are also required to plan for “restructuring” if they fail to make AYP for three years after being identified for improvement. More schools took corrective action under NCLB than under IASA. NCLB also required teachers to be highly qualified if hired using Title I funding. Modern applications of the Title I money have been diverse. Recent uses include wide-scale purchasing of iPads and other Internet using devices as electronic textbooks for students in 1:1 initiatives. Along with this, students from low-income families often do not have adequate Internet access from home. Thus, various public money, including Title I funds, are being investigated for possible use to provide cellular Internet access for students to receive remediation or other instructional content from home. The purpose of 24/7 internet access from home is to close the gap between higher income families where remediation resources are generally more available through parents and additional services and low-income students where such resources are scarce. Educational Technology advocates have long cited 24/7 Internet access as a boon to the education and advancement of at-risk children. Under NCLB, Title I funding is given to schools where at least 35% of the children in the school attendance area come from low-income families or to schools where 35% of the student population is low-income. To determine the percentage of low-income families, school districts may select a poverty measure from among the following data sources: (1) the number of children ages 5–17 in poverty counted in the most recent census; (2) the number of children eligible for free and reduced price lunches under the National School Lunch Program; (3) the number of children in families receiving Temporary Assistance for Needy Families; (4) the number of children eligible to receive Medicaid assistance; or (5) a composite of these data sources. The district must use the same measure to rank all its school attendance areas. The funds are appropriated for the use of improving academic achievement for students in low-income households. Title I funding is received by more than 50% of all public schools. NCLB also requires that for funding to be received, all districts and schools must meet adequate yearly progress goals for their student populations and specific demographic subgroups. Non-Title I schools are schools that do not receive federal Title I funds. Although school districts have some freedom in how Title I funding is distributed among schools within a district, Title I requires them to prioritize the highest-poverty schools. The Basic Grant formula provides funding to school districts based on the number of low income children they serve. To receive money through this grant, the school district must meet the requirement of having at least 10 poor children and 2% of its students in poverty. The Concentration Grant formula is similar to the basic grant formula in the regard that funding is given to schools based on the number of low income children they serve. In order to receive money through this grant, school districts must meet the requirement of having at least 15% of children in poverty or a total of 6,500 poor children. The Targeted Assistance Grant formula allocates more money for each child as the poverty rate in a district increases. This means that school districts with more poverty get more money for each poor child than districts with low poverty. The Education Finance Incentive Grant Formula is two-pronged approach. Its main intention is to reward schools that expend more state resources on public education and distribute funding in an equitable manner. It is also meant to concentrate funds in districts with high poverty that inequitably distribute state and local education funding. In states, funding is allocated to school districts in a way similar to the Targeted Assistance Grant formula but the weight of schools in districts with high poverty that inequitably distribute funding is doubled. Since 2001, Federal Title I funding has increased by 88%. In dollars, this has been a $7.7 billion increase. These funds were distributed through the Targeted Assistance and Education Finance Incentive Grant formulas, which target funds to disadvantaged students most directly. Title III of ESEA originally provided matching grants for supplementary education centers (Political Education, Cross 2004). Title III was the innovations component of ESEA. It was, for its time, the greatest federal investment in education innovation ever. Its best innovations, after validation, became part of the National Diffusion Network. This section of the original ESEA provided for strengthening state departments of education (Political Education, Cross 2004). The original Title V was amended to state the purposes of education reform efforts between local and state educational systems. Title V states that the government should endorse and support local education reforms that parallel reforms occurring at the state level. Parts of this section also state that the government should support innovative programs that help to improve an educational system. This includes support programs for libraries, scientific research leading to state and local educational agencies to put promising reforms into place, as well as for programs to improve teacher performance. Title V also provides government grants given to educational institutions appropriating money to gifted programs for students, foreign language developers, as well as physical education, the arts, and overall mental health care of children and students. Added during the 1967 reauthorization of ESEA, Title VII introduced a program for bilingual education. It was championed by Texas Democrat Ralph Yarborough (Political Education, Cross 2004). It was originally created to aid Spanish-speaking students. However, in 1968 it transformed to the all-encompassing Bilingual Education Act (BEA). In its original form, the BEA was not explicit in mandating that all school districts provide bilingual education services—it left much room for interpretation by districts. The ruling in Lau v. Nichols provided some clarity—specific program goals were established, support centers for bilingual education were created, and what a “bilingual education program” should look like was defined. The courts upheld the language of the BEA as it declared a “bilingual education program” as one providing English instruction in unison with the native language. The idea was to push students to high academic achievement via a program encouraging them to learn English while maintaining the native language. "It proposed to cultivate in this child his ancestral pride, to reinforce (not destroy) the language he natively speaks, to cultivate his inherent strengths, to give him the sense of personal idenfitication so essential to social maturation," summarizes Professor Cordasco of Montclair State College. In addition to programs for bilingual students, Title VII implemented plans to help Indian, Native Hawaiian, and Alaskan natives be provided opportunities for achieving academic equality. In late 1967, Congress gave $7.5 million to school districts, scholars, and private research groups who proposed the best programs for improving bilingual education. This section of the ESEA promotes the federal government working closely with local educational institutions to ensure that Indian, Hawaiian, and Alaskan students are being aided in getting the same educational experiences as all other students. This is achieved through programs that keep cultural values intact and push students to strive for academic excellence. In 1980, President Jimmy Carter established the Department of Education which allowed for the Bilingual Education campaign to expand bilingual education programs. In addition to Carter's efforts, President Clinton also showed his support through the Improving America's Schools Act of 1994. The act dramatically increased funding for bilingual and immigrant education. In 1998, the Linguistic Society of America showed its support for the BEA arguing that bilingual education was a basic human right; it believed that children should be educated in order to maintain their native language and cultural identity while acquiring the English language. In 2001 Texas authorized and encouraged school districts to adopt dual language immersion programs for elementary-aged students. It stipulated that instruction in each language should be split 50–50 in class. More recently The Civil Rights Project, a research center founded at Harvard University and located at UCLA since 2007 is calling on policymakers to develop a new vision for bilingual education. Gándara and Hopkins gather compelling evidence that shows English-only policies in the states that adopted these restrictions aren’t working The project proposes a new attitude that embraces bilingualism: “It is time that the U.S. join the rest of the developed world in viewing bilingualism as an asset, not a deficit,” argues Gary Orfield, co-director of the project. A 2014 bill, the Native Language Immersion Student Achievement Act, "cites reports from the Bureau of Indian Affairs and educational institutions 'that use primarily Native American languages to deliver education' and 'have indicated that students from these schools have generally had high school graduation and college attendance rates above the norm for their peers.'" The biggest obstacle to the BEA and expansion of bilingual education programs is the English-only Movement. There is no official language in the U.S., although some states have declared English as their official language. Three states in particular, California, Arizona, and Massachusetts, have declared English as their official language. In 1998, California passed Proposition 227 with the help of sponsor, Ron Unz, essentially ending bilingual education programs in exchange for an English immersion model which values assimilation over multiculturalism. In 2000, Arizona passed the English for Children initiative backed, again, by Ron Unz which mirrored California's Proposition 227 in replacing bilingual education programs with English immersion ones. Many Americans question whether bilingual education programs or English immersion models are the best route to helping students acquire English. The question of whether public education should encourage the development of the native tongue or completely leave that up to the parent is a difficult one. Some point out that California's Proposition 227 is failing the students for simply failing to address both the linguistic and cultural struggles that students face; in 2004, the test results for California public school students showed the achievement gap for English learners widening and the test scores of English learners to be declining across grade levels. Scholar Stephen Krashen maintains that these three states who have taken the harshest anti-bilingual education policies have seen progress that is modest, at best. In a report to the United States Government, an Arizona study shows that English language learners can take up to 13 years to attain fluency—most school programs only offer 3 years of participation in English-immersion or bilingual programs, putting the effectiveness of these programs into question. In order to ease the worries and qualms that people had in the programs' effectiveness, the Obama Administration has recently proposed the implementation of an evaluation system that it would require states to use in order to judge the progress seen in English language learners in schools. This would potentially restore faith in the bilingual programs and hold schools more accountable to student achievement and progress. The question remains if states are properly equipped across the board to meet such high expectations. Court ruled in favor of Puerto Rican and other Hispanic students whose language and cultural needs weren't being addressed. This triggered an increased development of bilingual programs in New York public schools. Court ruled in favor of Keyes recognizing the right that Hispanic children had to go to desegregated schools and not be racially isolated. The ruling recognizes Latinos’ suffering from systemic educational inequities. Court ruled in favor of Lau which guarantees students the right to a “meaningful education” regardless of language. This ruling ensures that districts will provide students with the same curriculum via initiatives such as bilingual programs and ESL classes. It also increased district accountability—schools with high numbers of English language learners must submit reports to the federal government to show they're providing adequate support for these students. Court ruled in favor of Serna that Portales Municipal Schools must provide a bilingual curriculum to accommodate the non-English speaking students. Texas also commits to employ bilingual personnel in schools. Court ruled in favor of Rios that the Pastchogue-Medford School District's bilingual program offered to students was essentially an English-only course. The ruling states that these students were denied an equal education since they weren't instructed in Spanish extensively in elementary school. Court ruled in favor of Castañeda that the school was racially segregating the Hispanic children in classes and not providing adequate bilingual programs to help them overcome English-language barriers. The decision established a clear evaluation system to hold bilingual programs accountable for providing equal educational opportunities (programs based on educational theory, implemented effectively, and proven to be successful in overcoming language barriers). Court ruled in favor of Horne that the state should have the right to determine the requirements of its English Language Learner programs. This holds schools less accountable for producing fluent English-speakers. ^ "Secretary Riley Reignites the Math Wars". hoover.org. Retrieved March 28, 2018. ^ ESEA. "No Child Left Behind Act". www.k12.wa.us. Retrieved March 28, 2018. ^ "Every Student Succeeds Act (ESSA) - U.S. Department of Education". www.ed.gov. Retrieved March 28, 2018. ^ Beyer, Bonnie; Johnson, Eileen S. (June 1, 2014). Special Programs and Services in Schools Creating Options, Meeting Needs, Revised, 2nd Edition (2nd ed.). Lancaster PA: DEStech Publications, Inc. p. 225. ISBN 978-1-60595-175-1. Retrieved January 22, 2015. ^ Archambault, Francis X.; St. Pierre, Robert (May – June 1980). "Effect of Federal Policy on Services Delivered Through ESEA Title I". Educational Evaluation and Policy Analysis. 2. Retrieved March 26, 2019. ^ a b c d e f g h i j National Center for Education Statistics. "Fast Facts". Institute of Education Sciences. Retrieved November 28, 2011. ^ a b c d e f Carmichael, Paul H. (1997). "Who Receives Federal Title I Assistance? : Examination of Program Funding by School Poverty Rate in New York State". Educational Evaluation and Policy Analysis. 19 (4): 354–59. doi:10.3102/01623737019004354. ^ a b c d e f "The Elementary and Secondary Education Act (The No Child Left Behind Act of 2001)". www2.ed.gov. December 6, 2010. Retrieved March 28, 2018. ^ "Title I, Part A Program". www.ed.gov. October 5, 2015. Retrieved March 28, 2018. ^ a b Farkas, George; Hall, L. Shane (2000). "Can Title I Attain Its Goal?". Brookings Papers on Education Policy: 59–123. ^ U.S. Department of Education (USDOE) (June 1992). "National assessment of the Chapter 1 program: The interim report". Washington, DC. ^ a b c d e f g h i j k l m n o p q r s t u "Part I: Title I In Perspective". National School Boards Association. Retrieved November 28, 2011. ^ a b Kennedy, M.M; Birman, B.F.; Demaline, R.E. (1986). "The effectiveness of Chapter 1 services: National assessment of Chapter 1". U.S. Department of Education. ^ a b c "Chapter 1 Survey of the Hawkins-Stafford School Improvement Amendments. A Report Prepared for the Subcommittee on Elementary, Secondary, and Vocational Education of the Committee on Education and Labor. House of Representatives, One Hundred First Congress, Second Session. Committee Print". Superintendent of Documents. February 1990. ^ a b c d e f g h "Executive Summary – Evaluation of Title I Accountability Systems and School Improvement Efforts (TASSIE): First-Year Findings (2004)". U.S. Department of Education. Retrieved November 28, 2011. ^ a b c d e f "No Child Left Behind (NCLB) Requirements for Schools". Great Schools. ^ a b c d e f g h i j k l m n "No Child Left Behind Act – Title I Distribution Formulas". New American Foundation. Retrieved November 28, 2011. ^ Lee, Jaekyung; Reeves, Todd (June 2012). "Revisiting the Impact of NCLB High-Stakes School Accountability, Capacity, and Resources: State NAEP 1990—2009 Reading and Math Achievement Gaps and Trend". Educational Evaluation and Policy Analysis. 34: 209–231. Retrieved March 26, 2019. ^ "Answers - The Most Trusted Place for Answering Life's Questions". Answers.com. Retrieved March 28, 2018. ^ "Forbidden Language: English Learners and Restrictive Language Policies — The Civil Rights Project at UCLA". civilrightsproject.ucla.edu. Retrieved March 28, 2018. ^ Wyer, Kathy. "The Civil Rights Project" (PDF). sudikoff.gseis.ucla.edu. Teachers College Press. Retrieved May 29, 2015. ^ Johnson, Bridget (January 17, 2014). "Bill Would Reward Schools That Teach All Curriculum in Native American Languages". The PJ Tatler. Retrieved February 27, 2014. Copy of the Original Elementary and Secondary Education Act of 1965, (P.L. 89-10; 79 Stat. 27), Federal Education Policy History website.